Salmonella may well be one of the most disreputable microbes in Western society. It’s infamous for its food-poisoning capabilities and has a well known history of wrecking the bonhomous vibe following a good summer barbecue, not to mention its singular ability to cast a sickly shadow over the breathtaking bounty of an all-you-can-eat buffet. 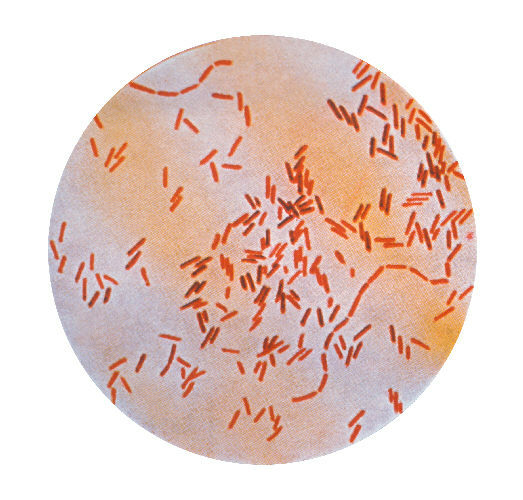 A gram stain of a species of Salmonella. Image: CDC. While Salmonella infection is commonly associated with food and with poultry and eggs in particular, it is a versatile microbe that counts reptiles, amphibians, and even adorable hedgehogs among its many friendly and accommodating hosts. In fact, an estimated 90% of reptiles harbor the bacteria as an asymptomatic intestinal infection and shed the microbe freely throughout their habitats (1). Contact with these animals, their feces or their contaminated food, water or soil can lead to Salmonella infection, and the CDC estimates that as many as a 100,000 Americans acquire salmonellosis from contact with these pets every year (2)(3). Perhaps it’s not the chicken breast resting on the kitchen counter we should fear but rather the cute (though, truly, not so cuddly) chameleon languidly ogling us from its tank. Young children are often the victims of reptile-associated salmonellosis with bottle-fed infants at the greatest risk of contracting an infection; the presence of pet reptiles in the home is the most common factor among such infections (4). When Salmonella infection does occur in young children, the disease can be severe and even fatal if it progresses to the point of septicemia and meningitis (5). A chameleon of unknown species. Image: Zorandim/Shutterstock. A few dreadful examples: in 2012, a 23-day-old boy was admitted to the hospital with meningitis and was found to be infected with a rarely seen serotype of Salmonella, S. kingabwa. The infant acquired this unusual strain during his visits to his grandmother’s house, where she kept five snakes and five water dragons that crawled throughout the home (6). In the same year, a 10-day-old girl was brought to the hospital for several visits over a period of ten months, showing symptoms of bloody diarrhea. Over the course of her visits, she showed a failure to thrive with poor weight gain, and her stools were found to harbor a strain of S. enterica spp. diarizonae. The source? Her mother kept snakes, lizards, and iguanas in the house, and upon their removal from the home, the infant recovered (7). The CDC states the facts of the matter bluntly on a webpage devoted to salmonellosis in these animals: “If there are young children in your home, reptiles and amphibians might not be safe pets for your family” (8). When interviewed, the father indicated that he knew reptiles carry Salmonella and was careful to wash his hands after handling them or their containers. However, he did not change clothing when he came home from work before holding his child. His young child, resting on his father’s chest following a hard day’s work of enriching young minds, had become infected while rubbing his face and hands on the same shirt that a boa constrictor had been slithering upon only hours earlier. This particular case typifies the shortcomings of good awareness and education: even simple hygiene precautions such as hand-washing may not be enough in some situations. When it comes to animal-borne infections, we have to fully consider our interactions with our pets. Do you cuddle with your puppies and kittens? Do your pet birds rest on your shoulders or head? Do you let your pets sleep in or near your bed? Do they crawl throughout your home, traipsing or wriggling over the furniture and kitchen counters? Do they groom you? These innocent behaviors could all lead to inadvertent infections with the microbes residing inside of our dear reptilian, avian, and mammalian companions. Beyond causing isolated cases of pet-borne infection, reptile and amphibian-associated salmonellosis is also responsible for substantial outbreaks in the greater population. In 2011, over 240 people in 42 states fell ill with gastroenteritis caused by the Salmonella typhimurium following contact with African dwarf frogs sold by a Californian breeder; exposure to the frogs had occurred in pet and toy stores, fairs, and carnivals. Of those infected, 69% were younger than 10 years of age. 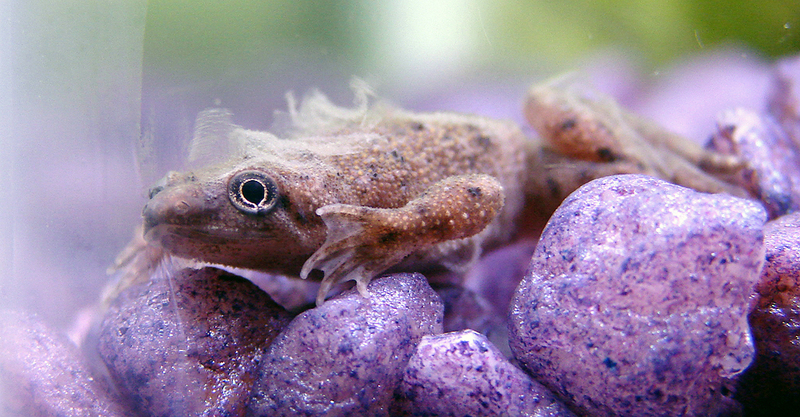 An African dwarf frog, Hymenochirus boettgeri, responsible for a multistate outbreak of Salmonella, serotype typhimurium Image: Matt Reinbold/Furryscaly, click for source. Furthermore, in the past two years, turtles with shells under four inches in length have been implicated in a series of outbreaks responsible for illnesses among 371 people in 40 states (12). Again, children have borne the brunt of this outbreak, with 70% of victims under the age of 10 and a third of the infected under one year of age. This outbreak was particularly troubling as the distribution and sale of turtles of this length – which can harbor over six different species of Salmonella – have been specifically banned by the FDA since 1975 (13). Educating the public on the risks posed to young children by these types of animals is imperative to preventing needless and potentially lethal infections. Sadly, the CDC conducted a poll in 2003 that found that only 4 American states – California, Connecticut, Maryland, Michigan, and New York – required pet stores to provide information regarding the prevention of reptile-associated salmonellosis to customers purchasing turtles (13). And that’s only turtles – forget about the exotic salamanders, newts, frogs, snakes, and lizards available for purchase. Public health officials, pediatricians, veterinarians, and pet shop owners must do their part to help educate exotic animal lovers of the bacterial risks that accompany their scaly companions, lurking like a snake in the grass. There’s another twist to this public health story: reptiles have also been found harboring antibiotic-resistant Salmonella. From Trinidad to Germany to Taiwan, reptiles have been found carrying Salmonella resistant to various antimicrobials, including some of our most prized heavy hitters like ciprofloxacin. See here, here, and here. In the 1970s, pet turtles under four inches in length were implicated in so many outbreaks of Salmonella – an estimated 280,00 annual cases! – that the FDA stepped in and banned all interstate shipments of the animal. Read the FDA’s Code of Federal Regulations regarding “Turtles intrastate and interstate requirements” to find out more. Watch as a chameleon shows off his camouflaging abilities, and taste in faux Ray-Ban sunglasses, in this video here. You’re welcome. 6. A Olariu et al. (2012) Salmonella kingabwa meningitis in a neonate. BMJ Case Rep. Published online here. 10. ME Kennedy et al. (1973) Salmonella Isolations from Snakes and Other Reptiles. Can J Comp Med, 37(3): 325–326.